First introduced in the 1990s in response to widespread pest resistance as well as health objections to older pesticides, the neonicotinoid insecticides quickly sailed to the top slot in global pesticide markets. Now the most widely-used insecticides in the world, it is difficult to find pest control commodities that do not contain one or several of the neonicotinoid insecticides. California alone has registered nearly 300 neonicotinoid products. Neonicotinoids’ toxicity to bees and other insects has brought them the most attention so far and has dominated recent concerns of regulatory institutions worldwide. In the United States, the Environmental Protection Agency’s registration review of the neonicotinoids is focused on the threat to insect pollinators. The seriousness of this issue should not be underestimated, as one-third of the U.S. diet depends on these insect pollinators. But much more is at stake. The environmental persistence of the neonicotinoids, their propensity for runoff and for groundwater infiltration, and their cumulative and largely irreversible mode of action in invertebrates raise environmental concerns that go well beyond bees. 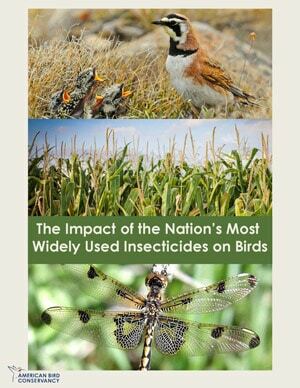 This report reviews the effects on avian species and concludes that neonicotinoids are lethal to birds as well as to the aquatic systems on which they depend. A single corn kernel coated with a neonicotinoid can kill a songbird. Even a tiny grain of wheat or canola treated with the oldest neonicotinoid, imidacloprid, can poison a bird. As little as 1/10th of a corn seed per day during egg-laying season is all that is needed to affect reproduction with any of the neonicotinoids registered to date.